Did you know that Collioure is a part of Languedoc-Rousillon the worlds largest producer of wine. And here we are walking around in the vineyards just a few weeks before the grapes are harvested to become A.O.C. Collioure 2014 wine from France. WIKI: The area has around 700,000 acres (2,800 km2) under vines and is the single biggest wine-producing region in the world, being responsible for more than a third of France's total wine production. As recently as 2001, the region produced more wine than the entire United States. WIKI: Viticulture was likely introduced to the area soon after the ancient Greeks introduced winemaking to the Languedoc are in the 6th century BC. 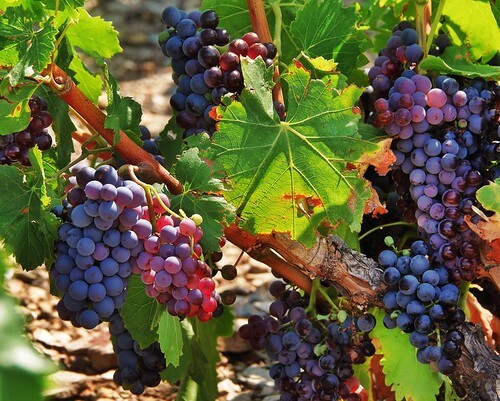 Under the Romans, viticulture spread throughout the area with the nearby cities of Narbonne, Carcassonne and Perpignan being major centers for the trade of Roussillon wine from areas like Collioure. For a large part of its history, the region has been under Spanish rule and was even a part of the Catalonia region until the mid-17th century. Like other Roussillon wine regions, this Spanish influence can be seen in the types of wines produced here. Even today, wine experts such as Hugh Johnson and Jancis Robinson describe the wines of Collioure as being more like Spanish wines in profile than French.